Cotton Lining Inside, Your Hands feels comfortable and no more Sticky. Easy to get them on and off. Besides, the cotton lining also enhance the heat resistant and give your hands full protection. Non-slip textured Gloves, which gives a secure grip to open jars. You won't worry about dropping hot Pan and Dishes. QUALITY ASSURANCE: The eco-friendly gloves are made of 100% food grade silicone, Non-toxic and odorless. You can wear the gloves to tend the BBQ meat and Hot roasted Chicken. the gloves are waterproof, non-stick and easy to clean. 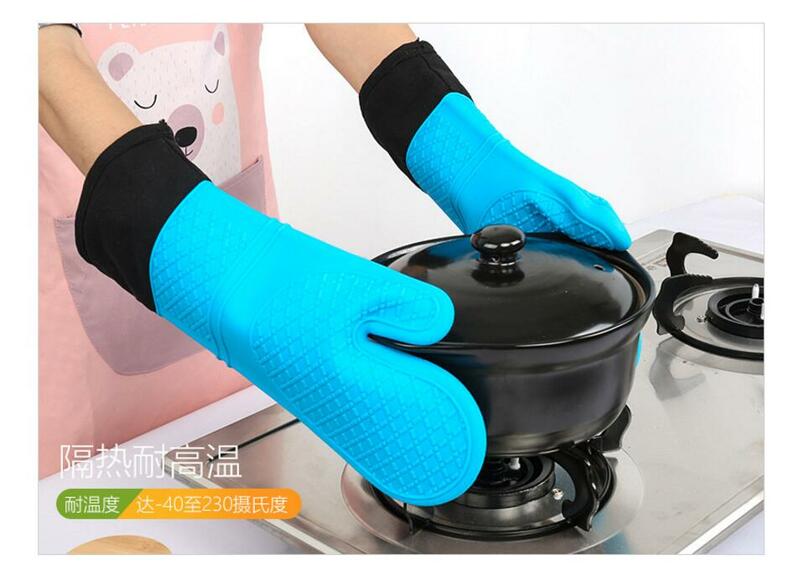 MULTI-PURPOSE USAGE: Aocome gloves can be used in many circumstances such as BBQ preparation, smoker grill handling, kitchen hot potholder, meat tearing, house cleaning and washing clothes in winter etc. You can even wear them for dish washing and freezer cleaning to protect your hands from cold injury. Looking for ideal Microwave Oven Cooking Glove Manufacturer & supplier ? We have a wide selection at great prices to help you get creative. All the Oven Cooking Glove are quality guaranteed. We are China Origin Factory of Heat Resistant Mitten. If you have any question, please feel free to contact us.